Dr. Daphne Pillai is the Founder President of Soroptimist International Bombay Chembur (SIBC) Club in Mumbai which is affiliated to Soroptimist International; a women’s organization which has consultative status in the United Nations. She has initiated and implemented several projects for the upliftment of women. SIBC under her able leadership and guidance continues to help many women along the way to aspire, achieve and enrich their lives. 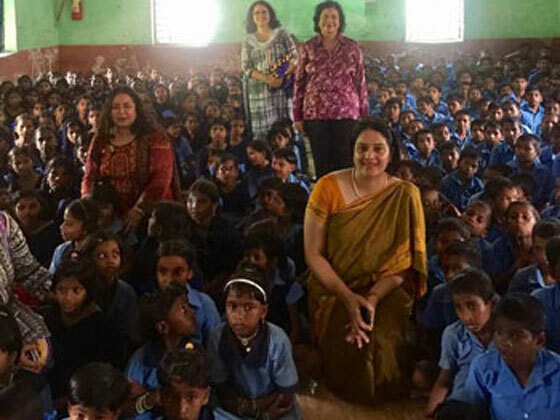 The Adult Literacy Drive is an Soroptimist project initiated by Dr. Daphne Pillai. This initiative was started to give women school drop outs living in the urban slums a second chance at education. There have been many socio-economic barriers which have prevented girls and women from pursuing an education. They reach a point where their self esteem and self worth is abysmally low due to this lack of education. The ALD provides them with a chance to achieve literacy and numeracy skills. Spoken English skills are also taught to them as feel that social and upward mobility is possible if they have spoken English skills. Income generation skills are also imparted to them like soft toy making, tailoring, beauty culture, etc. They are also given a platform to sell the handicrafts that they make. This workshop is held for those girl school dropouts in the age range of 18 years to 25 years who are pursuing computer skills like hardware, software, and other skills like hair dressing, beauty treatment, receptionists, etc. They are taught vocabulary and communication skills related to their professions and occupations. These workshops are conducted in Pillai HOCL Campus at Rasayani by a team of Soroptimist members. They are designed to meet the specific needs of the learner, the focus being on job-specific English language communication skills. This course is also extended to boys who are learning skills to become electricians, plumbers, masons, civil engineering work, etc. SIBC partnered with Mahatma Education Society’s Pillai Group of Institutions for constructing 5 toilets and 5 bathrooms for girls of the Varavane Shasakiya Ashram, a residential school for tribal children in Pen, Raigad District, Maharashtra. 33% of Zilla Parishad and residential schools for tribal schools do not have separate toilets for girls. Some have no toilets at all. Students especially girls drop out of schools after puberty due to poor toilet facilities. This project has stopped students from open defecation and has thus reduced instances of illness. The girls are happy to attend school have expressed a sigh of relief with this proper sanitation for them. Enrollment has increased for that school too. The toilets were inaugurated by Founder President SIBC, Dr. Daphne Pillai and other members in September 2017.